Whether you require non-slip epoxy flooring for official reasons, or simply because you worry about a slip and fall on your own property, our slip resistant floor coatings are highly effective. Slip resistant epoxy is fairly easy (for us) to install, it’s available in a wide range of colours and textures, and it’s appropriate for all industries. OHSA requires slip-resistant flooring when there is a higher risk of fall as a result of the work environment. In industries where the floor may become wet or hazardous due to spills, runoff, overflow, or repeated rinsing and washing, anti-slip epoxy flooring can save and protect your employees from unsafe working conditions. 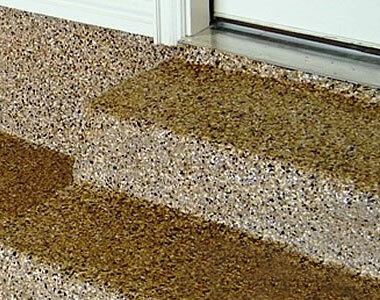 Non-slip epoxy can also be applied to stairs and steps. Stairwells become safer with added traction on the treads. In certain weather conditions such as slush and snow, steps in foyers and entryways can become treacherous when melting snow is tracked in from outside. An epoxy-coated aggregate finish can protect the public from the hazards of slippery situations. Home-owners can benefit from the added safety of slip-resistant epoxy coatings in the garage, workshop, finished basement, or even the kitchen. In addition to the safety benefits, an epoxy coating can increase the attractiveness and resale value of a home with unfinished or damaged concrete floors. 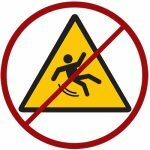 Slip-resistance can be defined as the roughness in a flooring surface that increases traction and minimizes the possibility of a slip and fall. In some environments, a more aggressive slip resistance is required. The amount of slip resistance can be adjusted based on the type and size of aggregate added to the epoxy coating. When aggressive slip resistance is required, floor cleaning requirements must also be taken into account. The rougher the aggregate, the more difficult it is to clean to floor. In food processing and medical environments, the roughness of the aggregate must be weighed against the level of sterility required. Aggregates are grains or chips of various materials that are added between layers of epoxy to create a roughened surface. Aggregate materials used with epoxy can include stone chips, plastic pellets, silica, sand, polypropylene, aluminum oxide, and even walnut shells. The epoxy application is a process that takes place over two to three days depending on the size of the job. Before any epoxy application begins, the existing concrete surface must be ground down and roughened. This will allow the topping to adhere properly and level out naturally creating a tough durable surface that will stand up to the abuse of the environment it was designed for. After the first layer of epoxy is applied, the aggregate is added. Once this layer hardens, the finishing layer of epoxy is then applied to seal the floor. Anti-slip epoxy floor coatings are great for preventing slip and fall incidents, but they also have other benefits. The epoxy coating seals the surface of the floor making it easier to clean up spills as well as increasing the resistance to staining and corrosive elements that might pit or damage an unprotected concrete floor. Oil spills, salt, and certain chemicals are just some of the things that can detract from the safety and attractiveness of your floor. For a free quote on non slip epoxy flooring for your home or business call us or send us a quick email. Serving London, Brantford, Kitchener, Cambridge, Waterloo, Guelph, Hamilton, Oakville, St. Catharines, Niagara Falls, Stratford, and all the smaller communities in between.